In this compact Laguna Niguel home, our team’s space planning skills were put to the test. 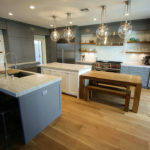 The result was a completely redesigned kitchen that flaunted both beauty and efficiency. Keep reading to learn how we managed to make a seemingly hopeless, tiny kitchen into the most luxurious part of the house. When our team arrived on the scene, the kitchen was very cluttered, cramped, and dark. The homeowners didn’t have much space to work with, so they resorted to stuffing things wherever they could. Its un-tidiness made the whole living space feel messy and suffocating, and the white finish on everything further diminished the appearance of space. Our team of professional Orange County contractors set out to plan a smart and efficient system that would solve all storage problems while lightening up the atmosphere. The redesign stage had one simple goal: streamline everything. We set out to make the most of the little space available by using carefully chosen materials and storage configurations so that no part of the kitchen was wasted. 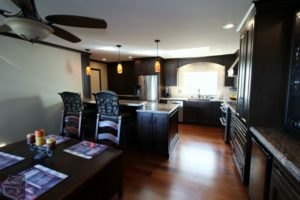 We started with installing custom Euro style cabinets in rich African Mahogany that smoldered with a Perfect Brown finish. Contrary to popular belief, using dark colors in a small space actually helps it to appear larger. This principle was applied by wrapping the dark wood all around the room, relying on the shaded hue to recede back and thus visually open up the area. 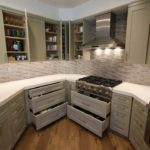 The cleverly planned cabinets feature imported Birch plywood interiors, glass panels, and dark Belcastel knobs and handles. With pull out drawers and stacked interior shelving hidden behind the new cupboards, the residents can now easily find a place for everything while keeping the kitchen pristine. And with the newly built bar area, there is added seating space as well. The warm tones of the Brazilian Cherry Jatoba wood flooring from Ark’s Sonoma collection play well off the cabinet’s deep color, as does the earthy gray tone of the Pacifica Wholesale Crema Bordeaux countertops with a 1 ½” Navid edge. To add even more interesting texture to the room, a tile backsplash was installed over most of the wall surface. The main part consists of Arizona Tile’s Split Face Pueblo Stone, and the lining tiles are Pacifica Wholesale’s Pacifica Pencil Liner Noce. Behind the stovetop range, a vineyard-themed plaque provided by the client serves as a personalized focal point. Rather than take up counter space by placing a microwave on top, a 24” Sharp Microwave Drawer was installed among the drawers beneath the bar area’s countertop. Opposite from this can be found a stainless steel Samsung 28 cu. ft. 4 Door Refrigerator with Counter-Height FlexZone Drawer and two laundry machines hidden behind custom folding cabinets. Thanks to the wealth of space opened up by the redesigned cabinetry, there was plenty of room to make up for the fact that the home lacked a proper laundry room. Further to the right is a 24” Bosch Pocket Handle Dishwasher, and a new farmhouse sink. Underneath a bronze textured hood is a GE Cafe Series 30” Free-Standing Gas Double Oven with Convection Range. Its large oven capacity of 6.7 cu. ft. allows the residents to cook multiple items at once, a must-have feature for such a small kitchen. 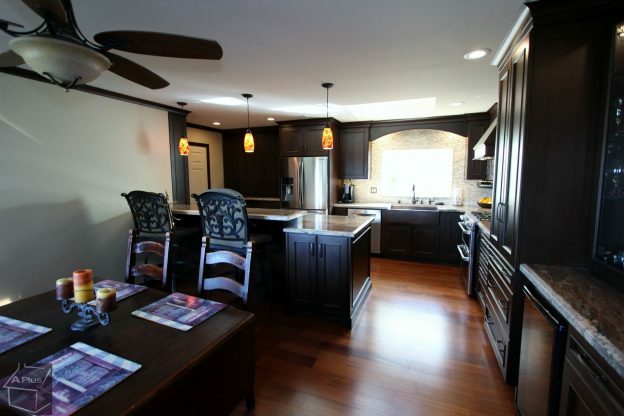 If you’re looking for your own new design build in Orange County, don’t hesitate to get in touch. Our team of experts will be happy to give you a personalized quote for your project!